Ala Wai Small Boat Harbor has been captured on film in "Gilligan's Island," "Hawaii Five-O" and "Magnum: P.I." Jack Lord stared down sternly upon it from an Ilikai balcony; the good ship Minnow chugged out of it for a three-hour tour that never ended; it was the scene of countless boatside parties in "Magnum: P.I." Ala Wai Small Boat Harbor is one of the best-known locations in Hawaii, and yet, unlike other natural landscapes in the islands, it's artificial. 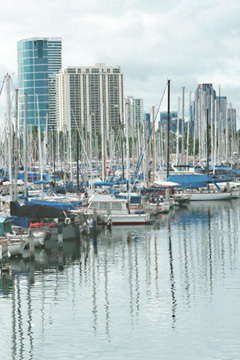 The Ala Wai Harbor was created in the 1920s when the Ala Wai canal was created to flush rainwater out of Waikiki. Ala Wai means "fresh water." It is often just called the "yacht harbor," thanks to the Waikiki and Hawaii yacht clubs homeported there, and the harbor is part of Kewalo Basin, a larger public-works project created to manage overspill from Honolulu Harbor. And Honolulu needed it, thanks to war emergencies. Honolulu Harbor -- the name means, pretty much, "protected bay" or "fair water haven" -- turned out to be inadequate during the Great War, and Kewalo Basin, to the east, was constructed in the 1920s to ease congestion and provide docking for lumber schooners (the city was in a building boom at the time). The concrete wharf was finished in 1926 and commercial fishing sampans began mooring there. The following decades boasted a spate of pier building and harbor dredging, while the pleasure boats at Ala Wai harbor multiplied into the forest of masts you see there today. The Waikiki Yacht Club was created in 1944 by pleasure sailors who had been beached by wartime security regulations. One of the founding members was -- no surprise -- Duke Kahanamoku. Within a few years, the club hosted the first post-war running of the Transpac yacht race, which is more than a three-hour tour.